Cultural critics frequently point out how rude people have become. The need for patience, consideration and kindness is the mindset that provides the antidote to this cultural dysfunction. 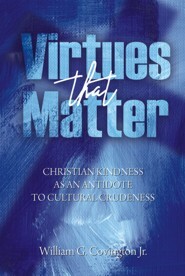 Christian virtues that enhance the quality for everyone, the initiator and receivers is discussed in this book. Each chapter includes a reflection section that helps one apply the principles covered. Is it credible to claim that any reader of a book who applies the contents could enhance the quality of his own life as well as that of others with whom he interacts? This book examines issues that hold the potential for such direct far-reaching aims. Rather than curse the darkness of uncivil behavior in culture, this book shines light in providing an antidote that enhances the personal reputation of one interacting in the public sphere while making other people feel better that their lives have been touched in the process. Character is built on feeding one's mind the proper intellectual and spiritual content. Healthy relationships grow out of win/win exchanges. Having something of value to offer others grows out of an altruistic heart. Actions grow from thoughts. Mutually beneficial dealings leads to a higher quality of life for everyone involved. Virtues taught by Jesus have been the antidote to self-serving narcissistic thinking everywhere they're been applied. Fulfillment comes from extending one's focus beyond self-gratification. Each chapter ends with a series of reflection questions which helps a person gain perspective on how these principles apply to him personally and how they can be applied for a higher standard of living for self and others.